Do you have a train lover in your family? My two younger boys (ages 5 and 2) are big fans of trains. When my middle son was younger, there were days were all we did was play trains. I really wondered if there would be a day where he wouldn’t like trains?! It’s safe to say that we used our wooden train tracks daily. I recently was sent a new book called Old Tracks, New Tricks. As soon as it arrived, my boys begged to read it. They were hooked! 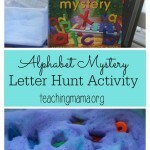 Today I’m sharing with you an alphabet activity we did to go along with this neat book. First of all, let me tell you more about this book. This book is ADORABLE. 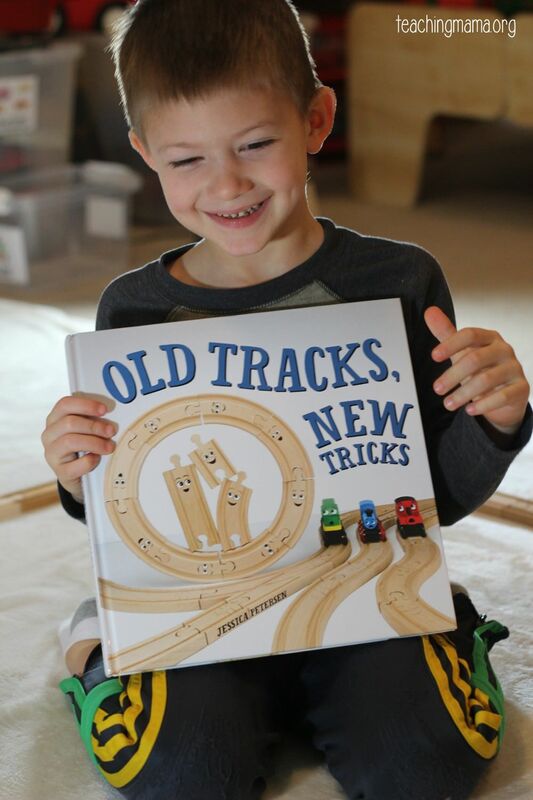 Old Tracks, New Tricks is a story about three little wooden train tracks who shake up an old wooden train set. 3 wooden tracks are excited to join a train set, but they quickly become disappointed when their new home is not was what they expected. 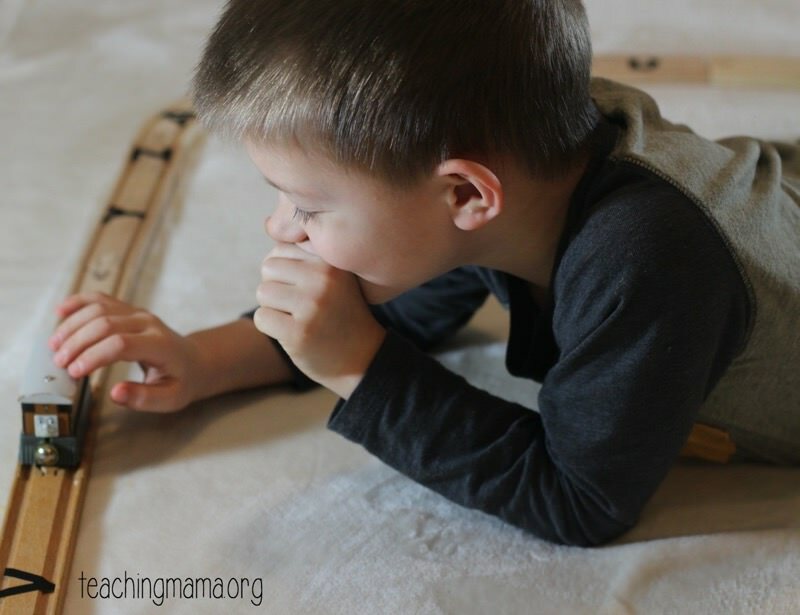 The wooden trains are bossy and order them around. 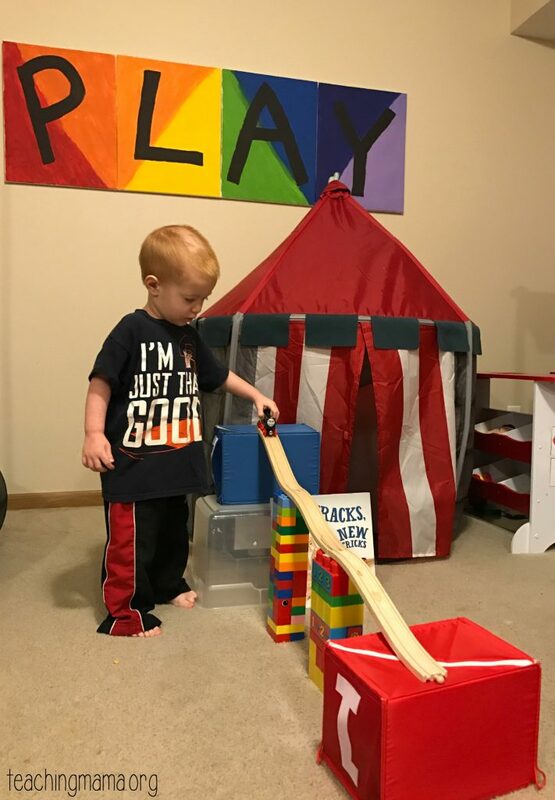 After a little creativity, the tracks convince the trains that it’s fun to try new things and show them some fun ways to use the tracks. 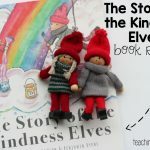 The creative storyline captured my children’s attention right away and they wanted to read it over and over. I love the dialogue in this story. It’s so cute!! In the back of the book, there are creative ideas for how you can use your wooden train tracks in unique ways at home. 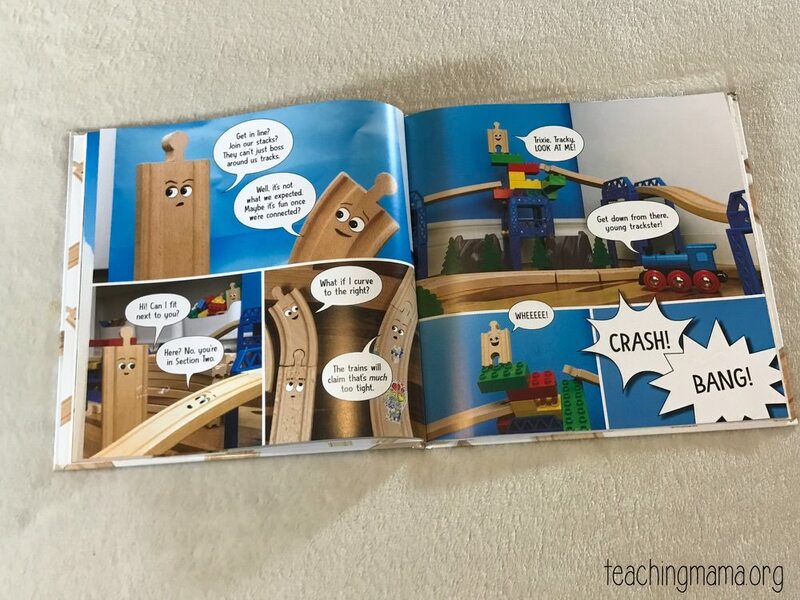 The same day we got this book, we tried out this idea using Lego bricks and tracks together. It kept my boys busy all morning long! 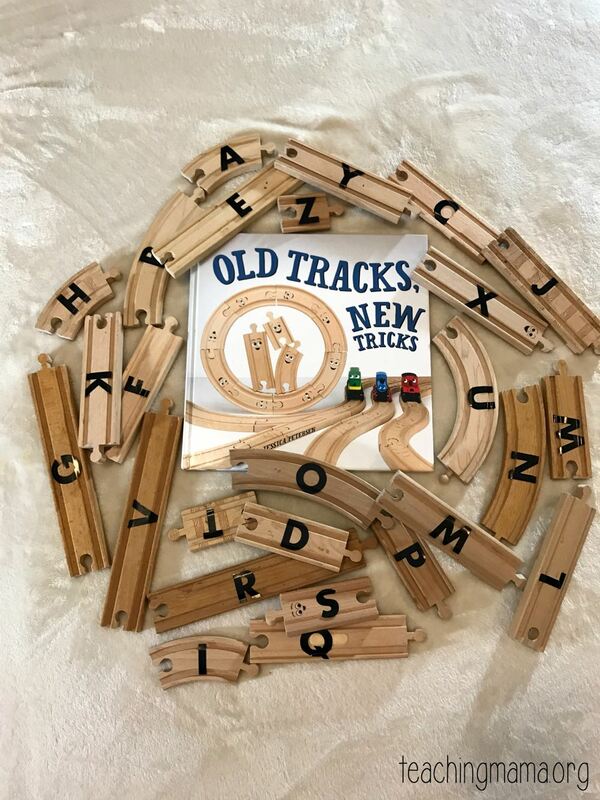 We also came up with a fun alphabet game using wooden tracks. This idea isn’t from the book, but I thought it was a fun extension of the book. For this activity, you just need wooden tracks and alphabet stickers. The stickers we used are from Target. You set up a train track in any formation you want. We chose a circle. Then you add an alphabet sticker to each track. I used large stickers, but I think smaller stickers would work a little better. Then take the track apart and mix up the train tracks. 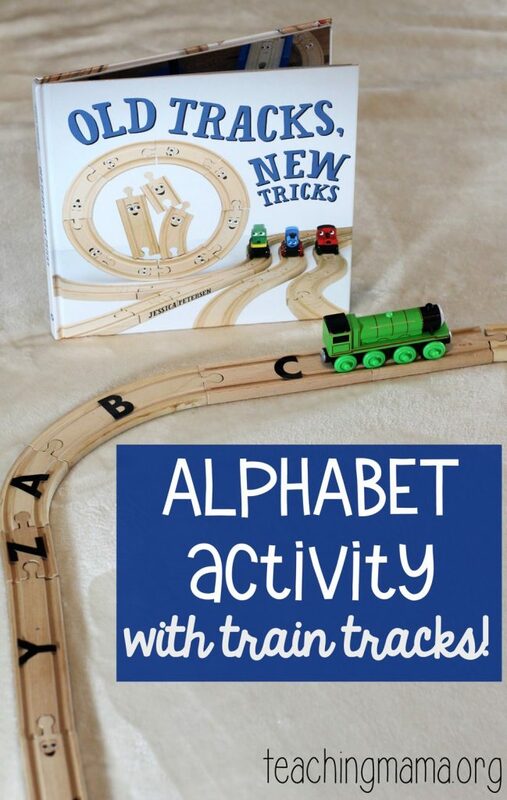 Have your child put the tracks together in alphabetical order. 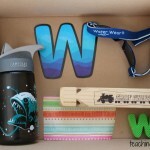 It’s a fun way to practice the ABCs. 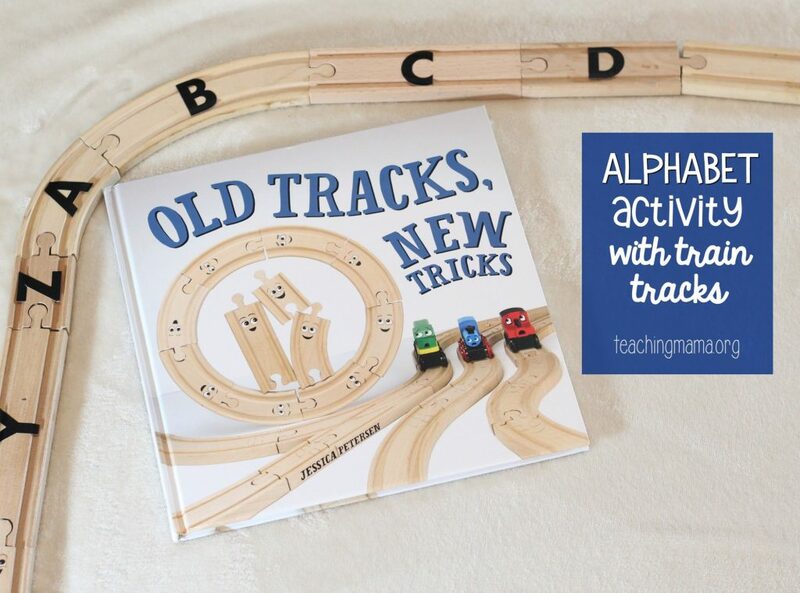 Sing the alphabet song together as you construct the train track. Once the track is put together, zoom trains around it! 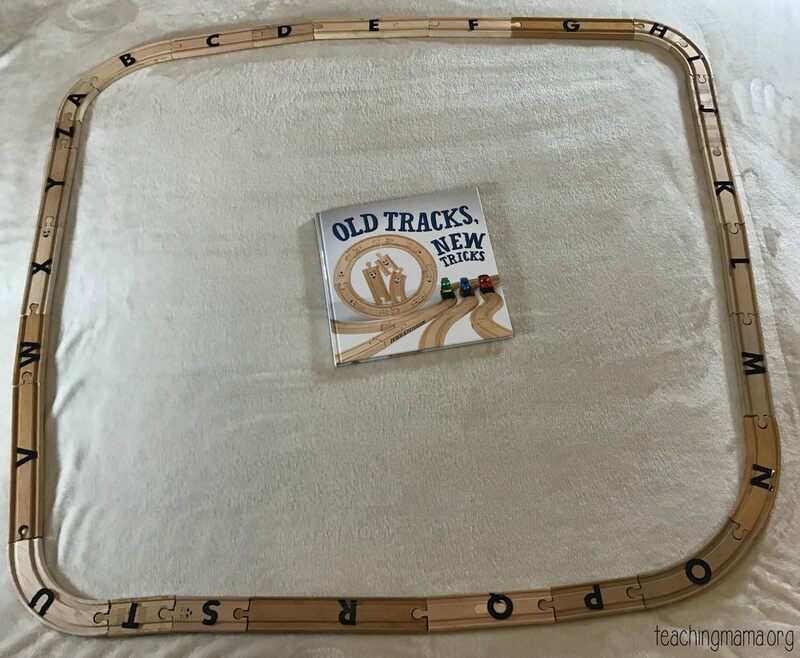 This was just one way to play with train tracks in a fun, new way. 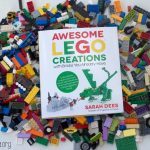 There are so many neat ideas in this book! I highly recommend this book for all the train lovers in your life! 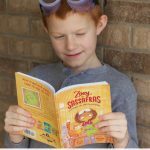 If you want to see a little more about this book, check out this free sample of the first few pages HERE! This book is for sale in bookstores and also on Amazon. Hope you enjoy it as much as we did! Thank you so much for sharing this great idea. My daughter is turning three years old and we think this is the perfect time to teach alphabet to her. Could you tell me how many letters should I focus on in a week? I plane on getting the book and trying it out. It look like something the children would love. I will let you know how it turn out later, after I get the book. thank You for the idea. Such great ideas! I have a train lover but have never heard of the book. I will have to order it. We definitely have enough tracks! !